Bread and freedom: essential to happiness? I really enjoyed Steven Spielberg’s film ‘Lincoln’. It’s so stimulating when a director is able to present some of the detailed exchanges and manoeuvres which make up the nitty-gritty of political life, and show us how interesting and vital they are. I was also delighted when, on January 17th of this year, Paul Mason did a piece on Radio 4’s ‘Today’ programme about Abraham Lincoln’s connection with the city of Manchester (where I was born). Two days later some of us were celebrating the 150th anniversary of the American President’s drafting of a letter which he addressed to ‘the working men of Manchester’ on January 19th 1863. When the American Civil War began in 1861 the area around Manchester was far and away the world’s largest producer of manufactured cotton, with 2,400 spinning and weaving mills employing 440,000 workers. Most of the raw cotton came from the USA’s southern states: 1.1 billion pounds of the fibre were being shipped every year to Liverpool, and then transferred to Manchester via canals and railways. When the Union side (i.e. Lincoln’s side) imposed a naval blockade on the southern states, cotton imports dried up. Hundreds of Lancashire cotton mills were closed, and thousands of workers laid off. People were starving, and many were evicted from their homes. Some mill owners, and some of the shipping magnates in Liverpool, were campaigning for British military intervention to break the blockade on the southern ports – they supported the slave owners, in other words. The 13th amendment to the constitution which abolished slavery in the USA was passed by the Senate in 1864 and adopted in 1865. This was the achievement which Spielberg’s film was highlighting (sadly but understandably, the Lancashire mill workers didn’t get a mention). 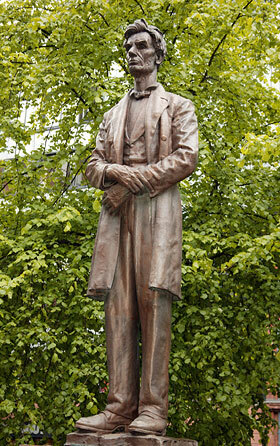 The statue of Lincoln shown in the picture was unveiled in Manchester’s Platt Fields in 1919. In 1986 it was moved to a new public space, Lincoln Square, on Brazenose Street in central Manchester. One interesting footnote to the story is that when the statue was relocated, Lincoln’s words, as recorded on the plinth, were altered so that the letter was addressed to the ‘working people of Manchester’ rather than the ‘working men’. The majority of people employed in the cotton industry were, after all, women. 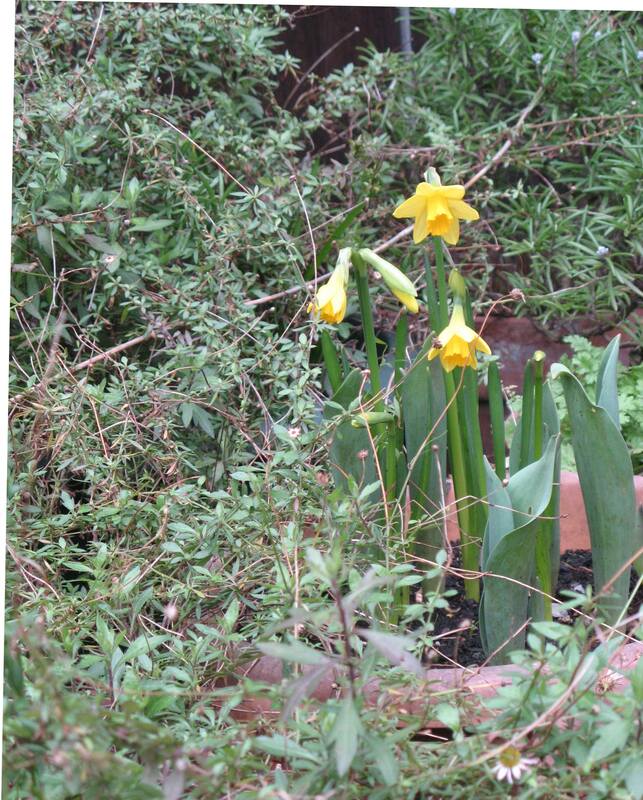 YESTERDAY I spent three hours pruning my plants, so obviously it must be nearly spring. Gary the plumber came round this morning, and told me that for 10 years he worked in banking in Canary Wharf; nowadays, though he’s earning much less money, he’s also a good deal happier. So then I knew that it was high time I got back to my happiness blog. IN NOVEMBER/DECEMBER last year the UN climate change conference took place in Doha. At the same time a UN panel was looking at the tiny Buddhist state of Bhutan (to the north-east of India) and discussing how the rest of the world might benefit from its Gross National Happiness project. ON THE ROAD TO THE AIRPORT IN BHUTAN there are hand painted signs offering life affirming mantras, such as ‘Life is a journey: complete it’, and ‘Let nature be your guide’ (both the Stoics and the Epicureans would have loved that one). The government of Bhutan recognises that the value of economic growth – one of the few mantras recognised by western capitalism – has to be judged not in terms of the prosperity it produces but according to the contribution it makes to Gross National Happiness; that is, to the spiritual, physical, social and environmental well-being of its people. IN THE LAST 20 YEARS life expectancy in Bhutan has doubled. Almost 100% of its children are now enrolled in primary schools; and the move towards environmental sustainability has been enshrined in its constitution – the country has pledged to remain carbon neutral, and to ensure that at least 70% of its landmass will remain under forest cover in perpetuity. Export logging has been banned, and a monthly pedestrian day – when all private vehicles are barred from the roads – has been introduced. THE PICTURE in Bhutan is by no means 100% rosy. The country is struggling with growing poverty, and 70% of the population lives without electricity. Bhutan is also of course immensely vulnerable to global climate change. The new pattern of unstable weather conditions that we ourselves are becoming used to – especially the violent storms – is devastating for the 70% of people in Bhutan who earn their living as smallholder farmers. We – the wealthier nations who have electricity and cars and consume both of them furiously – are causing this problem, not the Bhutanese themselves. Up until fairly recently Bhutan had an absolute monarchy. But in 2008 the first general election to the national assembly was held. So politically it probably leaves a lot to be desired. I don’t think this tells us that one-man rule is a jolly good thing; rather, that western style democracies aren’t necessarily the ‘sine qua non’ of human happiness. We in the UK need to bear this in mind the next time our government considers invading a country like Iraq. March 19th will be the 10th anniversary of the start of that shameful operation, and if yesterday’s excellent Radio 4 documentary After Saddam told us anything, it was that the invasion did not contribute to the overall well-being of the Iraqi people. Saddam Hussein was a hideous dictator, and I don’t know what the solution was to that particular problem. But the answer for us in the UK should have been simple: don’t go there, it’s not going to help anyone. I shall never forgive Tony Blair for the way he manipulated the truth – told lies – in order to get his way on this. It certainly made hardly anybody happy.